05 DecIs Prototyping Possible Without PCBs? You will need a soldering iron, perfboard, kynar wire, wire stripper, needle nose pliers, wire cutter, solder paste, 0.8 mm rosin core solder, helping hands tool, tweezers, and reading glasses. You can reduce the length of wire needed by placing the components. Bend the pins outward on the backside to hold the components in place. Also, try and use IC sockets whenever you can, and ensure that they are empty during the assembly process. Furthermore, integrated circuits should not be soldered onto the board. Use a pencil to fill the holes for component wires and socket pins. The components should be checked several times. If you are using IC sockets, then number the pins and name the IC. You should also refer to the circuit schematic. Lines should be drawn to connect the ground rails and to the components. Wiring should be drawn for all the other connections. Moreover, because there is a very limited amount of space for wiring connections on a pin, you should avoid having more than two wires connected to a component or a pin. The end of the wire should be stripped around two millimeters. You will then need to measure the amount of wire required. The other end should then be stripped and the bare wire ends should be looped. Next, you will need to place the loops around the component wires or the pins. You can create a temporary hold by crimping them. In order to make them permanent, you will need to solder the connections. Clear your workbench and activate your soldering iron. The circuit board will also need to be affixed to the helping hands tool we mentioned earlier, back side up. In order to determine which connections need to be made, you will need to use the planning sheet. You will need to strip two millimeters of insulation from the end before you actually cut the wire. In order to ascertain approximately how much wire you will actually need, you should line up the wire on the perfboard in order for it to extend from one connection contact to the other connection contact. Then, add five millimeters of extra length, carefully cut the wire, and then strip off two millimeters of insulation. If everything is performed according to plan, then you should be left with a wire that has two millimeters stripped off both its ends. Create even loops over the bare ends of the wire using your tweezers. You will then need to fit the loops over the component wires of the pins in question. In addition, if you have some other wires that have already been soldered in place, then you can opt to feed the wires below your existing wires. By doing so, you will be able to hold them in place before you actually solder the new wires. You will need to crimp the loops very tightly around the pins using tweezers. Also, please note that the connection will only need to last as long as the time it takes to actually apply the solder. In some cases, you may wish to connect more than one wire to the pin. If this is the case, then you have a choice to make. That is, crimp a second loop to the same pin and then proceed to solder both wires. Or, you can opt to solder only the first wire to the pin. As for the second wire, you will need to keep it straight. In other words, do not loop the second wire. If you want to connect it to the pin that has already been soldered, you will need to dip the wire end in some rosin paste. By doing so, the solder will be far more likely to bind to it while also cleaning it. Next, reheat the solder on the pin and then carefully push the wire onto the molten hot solder. In some instances, you may decide to use solder paste. If you decide to use soldering paste, then remember to avoid using large amounts. This is because the paste may carry current, and failure to remove any paste residue will lead to havoc being wrecked on your circuits. Any excess paste can be easily removed using some isopropyl alcohol and a toothbrush. You will need to continually repeat steps five through seven until all of the connections have been made. As you continue to make progress, you may find it relevant to complete an integrated circuit, or some other such component, and then commence on another component. By doing so, you will be able to routinely test each circuit as you construct it. 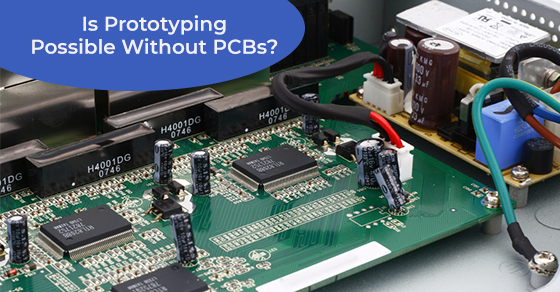 In some cases, having the right tools, instructions, as well as the necessary patience and manual dexterity, will make it possible to prototype without a PCB. If you would like to learn more about prototype production or need help with your prototype project, then we can help. Circuits Central provides electronic manufacturing solutions for prototype production and other such projects. We specialize in manufacturing, pre-manufacturing, and post-manufacturing as well. From commercial, industrial, and medical, to communication, defence, aerospace, and consumer products, we are an all-inclusive company that is dedicated to going above and beyond the call of duty to breed excellence. To discuss your prototype production needs, give Circuits Central a call at 1-888-602-7264.